JR & BabyPom: We were a bit hesitant about letting Mommy get this. You know her love for pups, who knows if she'd bring another one home. JR: It was right around last Christmas that BabyPom joined us! BabyPom: Well, now she won't have to...maybe, since she's got them all on screen! You know, Santa Paws 2: The Santa Pups!! It just came out November 20th and you know how much Mommy loves those Disney movies. JR: So, I hear. It's supposed to be a heartwarming and hilarious adventure starring a new litter of Great Pyrenees pups. Here's a quick trailer. JR & BabyPom: Hmm, these four pups: Hope, Jingle, Charity and Noble are trouble makers, kind of like us, but they don't mean any harm! They try to make good again but finding the Christmas spirit and granting wishes as Santa’s Helpers. Until they accidentally grant one little boy's wish to make Christmas go away forever! How will they ever reverse the spell? Okay, I think Mom's already sucked in at this point. What do you think Mom? Mom: It definitely is tough for me to resist puppy movies and this one is no exception. With a run time of 88 minutes, this new addition to the Santa Paws series, just like the other Disney Pups movies, is aimed towards kids. I know it but still love and watch them because of the adorable fluffiness that worms their way into your heart, no matter how old you are. It's a wonderful and fun way for kids to learn about the true meaning of Christmas and would make for a great family movie this holiday season. There are also 2 bonus features included that will have kids singing classic Christmas songs and a hilarious reel of bloopers that'll have everyone cracking up. JR & BabyPom: See, we knew she'd love it. Don't forget to scroll down to enter to win a copy of Santa Paws 2: The Santa Pups for yourself! Buy It: Shop online or in stores for Santa Paws 2 ($29.99+). 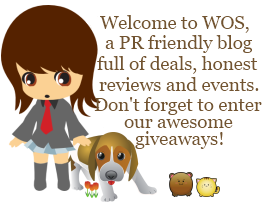 Win It: One lucky WOS reader will win their very own copy of Santa Paws 2: The Santa Pups! Enter on the Giveaway Tools form below between Dec 29 10PM EST to Jan 06, 2013 11:59PM EST. Open to US/Canada, 18+. Good luck! The whole family loved the original Santa Paws movie, and Santa Paws was our favorite pup. We have two large mixed breed rescue dogs. It was Artie's first Christmas with us and we had a blast spoiling him. My daughter would just love me to death if I won the Santa Paws 2 movie giveaway cause I'd give the movie to her! We enjoyed watching the Santa Paws 1 movie. I bet Santa Paws 2 is also a great movie. We have 3 dogs, 2 bassett hounds and a weenie dog. I have 2 rescue dogs, a large mix and a puppy-mill survivor pug. My pug hates looking at snow, and the other loves it. She's been in and out all day playing in it. I had a dash, she passed away Nov 2011, I miss her so much, been thinking about getting another one. This looks like such a cute movie, I would love to have it to enjoy with my grandchildren.